You no longer have to only get your ammunition from the gun store. What if we told you that you could use spent brass casings and reload them for usable ammunition? Reloading dies are a great way to save money and make your own customized ammunition which you can use to improve your accuracy or work with your own custom rifle. What is a Die and What is it Used For? Let’s explain exactly what a reloading die is and what it’s used for. Dies help with hand reloading, which can be a popular part of customizing and owning your own firearm. Hand reloading takes more time than purchasing premade ammunition, but with dies and the correct hand reloading technique, you can personalize your ammunition and fine-tune your shooting experience. This can also be more economical than buying pre-made ammunition, such as 6.5 Creedmoor cartridges. These items often come in sets of two or three, and which you’ll need depends on the kind of ammunition you’re making. In general, the first handles size and decapping, while the second of a three piece set will expand the bullet case mouth. The final item of the set will seat the bullet and might apply a crimp. Dies are often popular because they are set firmly into a press and ensure consistent precision for each bullet made, reducing the likelihood of the creation of poor bullets. A 6.5 Creedmoor die is, therefore, an item specifically designed to reload 6.5mm Creedmoor cartridges. Before you buy a 6.5 Creedmoor die set, there are a few things to keep in mind that will help you tell good sets from poor ones. Let’s go through some common aspects that you should look for when selecting a set. For the seating die, try to find something that has adjustments down to the micrometer. This will allow you to better shape each individual bullet, which will have real effects on your shooting accuracy when you use these rounds in the field. You can get by with adjusters that are not this precise, but if you can at all help it, try to go for the micrometer size. Do you want a whole set, or just one? You can get singles that only accomplish one part of the reloading process if that’s what you’re after. Consider this and make sure you get the right kind, such as one for seating, decapping, etc. You want to consider the size before you make a purchase. There are differences between the various sizes. Full-length body dies will size the entire length of the round in the same process. Some others don’t touch the neck of the cartridge, only affecting base and shoulders. There are sometimes neck-only dies which only size the neck. You’ll have to decide what your goals for your ammunition are and buy items of the appropriate size. The brand is also incredibly important because certain brands have been in this business for a long time and know how to make exceptional die sets. Go with a brand that’s well-known and has experience making good die sets instead of an unknown manufacturer if you can help it. Now that you know what to look for in a good 6.5 Creedmoor die, let's dive into the best sets on the market. We'll explain what makes each worth your while. For one of the best seater dies on the market, you can't get much better than this set. It's a non-crimping style seater that can hold your bullet case in the exact alignment necessary as your bullet is press fit sealed. The micrometer measuring notches are written on the side so you can see exactly what measurements it's currently set to at any point in the process. In fact, this is so precise that it can go down to .0005" for its adjustment settings. The settings are marked at increments of .001” so that you truly have the capability to fine-tune your seating process. Adjusting the micrometer stem down to the right depth is very easy thanks to smart construction and excellent quality of materials. It’s a great pick if you only need a seater die, but it obviously lacks all of the other types that come in a full set. The asking price is a little high for one piece by itself, but if you’re after the ultimate quality you might find that this is what you’re looking for. This is a quality, easily adjustable seater die that's extremely precise and well worth the asking price. However, it's not a full set, so if you want a full collection of all types you'll need to continue on. This set is a full-length collection where each piece is made with care and precision calibration. 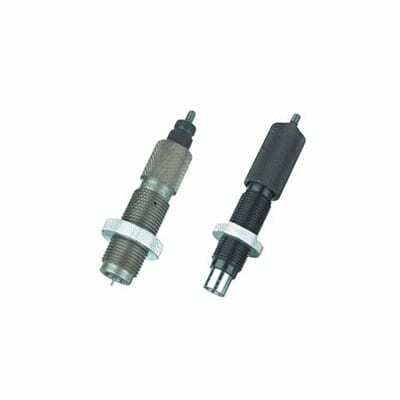 Of the three pieces included, there is one sizing die, a seating die with a micrometer seat stem, and the next sizing die. This set goes the traditional expansion route that usually takes it to the next level, allowing you to size the neck of your rounds to your specifications. This is a bit of a niche function, but if you are already planning on adjusting the necks of your cartridges, you'll find that being able to get a whole set all made from the same premium quality materials is a great find, for a reasonable asking price to boot. On the other hand, if you do need an expansion die, this is unfortunately not the set for you. This set also comes with an excellent stand for storage, and adjusting the seater die is extremely easy as all of its measurements are marked clearly on the side. This three piece set forgoes the traditional expansion die in favor of a neck-sizing die that you don’t see in a lot of sets these days. It may be one of the only ways to get a good neck sizing die. Each item is made with high-quality materials, and the set comes with a storage stand. This set offers a lot of value for the money, which is a little high, but acceptable, once you see everything you get with the purchase. It contains three pieces: a Bushing neck sizing die, which is a rarity, a body die that is full-length and fit for resizing or bumping the shoulder position without changing the neck of the cartridge, and the competition seating die that has a stem fit that is so precise that it can actually float on a column of air. The micrometer seating die has been made to be calibrated in .001” increments. Plus, there’s a handy zero set feature that lets you zero the micrometer setting to whatever your rifles native seating depth is. This can help for matching rounds to a rifle that you already use. The full-sized body die has been designed for resizing cartridge cases that are already difficult after they had been fired a few times as their necks have already been resized. This set comes with a holder as well, but it lacks an expansion die so it’s not a true, traditional three piece set. That being said, the addition of the neck sizing die might be perfect for those of you planning on altering your neck sizes already. This is an extremely valuable set that’s made with precision and care and which has another rare neck-sizing die in addition to a body die and a seating die that is extremely precise. The seating die comes with a zero set feature to sweeten the deal. For those of you looking for one purchase to take care of all of your 6.5 Creedmoor needs, this might be the set for you. This set comes with four pieces in total: a sizer die, a mouth expander die, a seater die, and a crimp die. You’ll notice that the traditional crimping and seating functions which are usually combined into the third die of a set are separated into their own individual pieces. This can allow for greater precision customization for all of your cases and cartridges. That’s a lot of value to be had with one package. Perhaps best of all, this four piece set is extremely affordable. You’re getting a true bargain with four complete, individual dies for the asking price of some singles from other competitors. 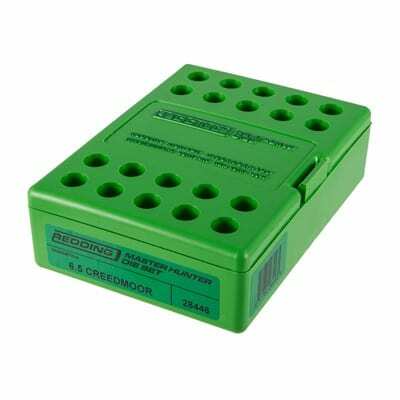 These come with a shell holder to make your reloading process that much more convenient and enjoyable; a powder holder is also included just to add more value to the purchase. They are made from high-quality steel. 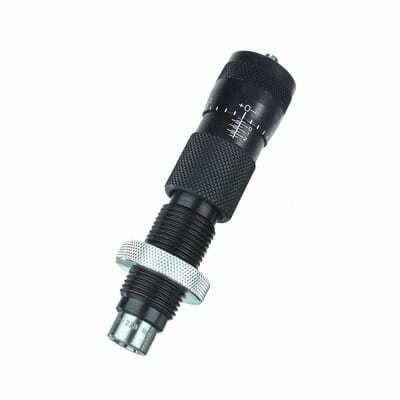 The crimp die has threads at 7/8 of an inch. Overall, this is one of the best picks you could make if you need a full set but also don’t want to break the bank at the same time. 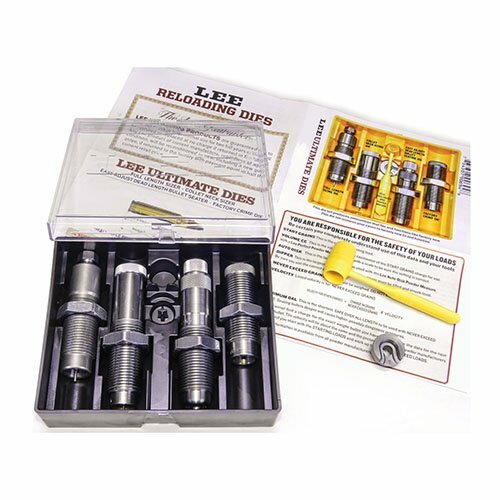 This four piece set comes with pieces for each part of the reloading process. A storage case and powder measure are included with the purchase, and each item is well-made with high-quality steel and designed for ease-of-use. 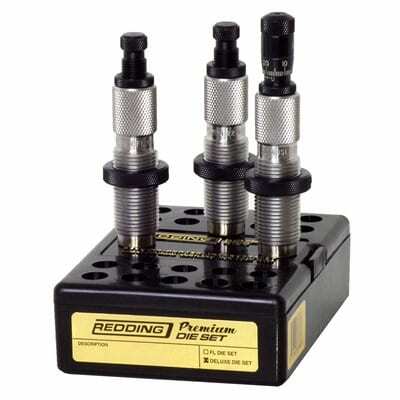 This Redding die set comes with two items that are made to precision standards, which are extremely easy to use. The full-length sizer die is one of the best on the market and is made with all of the same attention to detail and high standards that Redding is known for. Meanwhile, the micrometer adjustable competition seating die is very easily adjustable and all of its measurement markings are clearly displayed at the top with small increments so that you can change the seating setting one micrometer at a time. Both pieces are made from high-quality steel and come with a storage box which can fit on any workshop shelf. However, this set lacks an expansion or neck sizing die, which makes its asking price a little high, since you're only getting two pieces in total. Still, in terms of quality, this pair are some of the best examples of sizing and seating dies, respectively. Although there are only two in this set, it still offers a high-quality set. The adjustment options are precise and the product is durable. With the addition of the storage box, this is a great set of quality dies. This is another two-die set that has both a sizing die and the seating die. Both are made from very high-quality steel that's built to last and resist corrosion or rust. 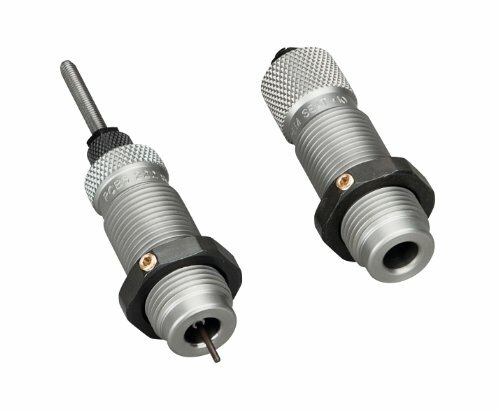 They were each crafted with precision manufacturing techniques from RCBS to ensure that they were both sized correctly and manufactured to remain functional throughout thousands of uses. The sizing die is a full-length type and the seating die is micrometer adjustable. Adjusting this seating die isn’t as easy as some other models because the adjustment increments aren’t as easy to see, although this isn’t much of an issue if you have a favorite setting and don’t tend to deviate from that from case to case. Since this set lacks an expansion or neck sizing die, you’ll need to look elsewhere if you need either of those two parts in particular. When it comes to value for money, however, this pair is a great choice because extremely affordable even if you’re only getting two pieces in the purchase. They’re very high-quality for the asking price. Combining this set with another, similarly affordable expansion die might be a great idea if you’re looking to put together a bargain set. This is a very affordable two piece set that contains a full-length sizing die in the micrometer seating die. This lacks an expansion die, but you get these two at an absolute bargain and they are made of high-quality steel that’s designed to last for a long time. 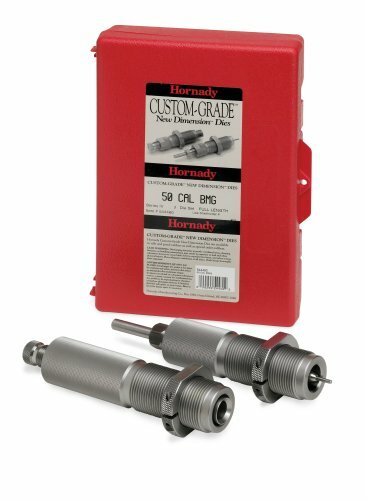 Hornady brings us this pair: a sizing die that is full-length and a micrometer seating die. Like the last set, this set is very affordable for the two pieces that you get with the purchase. It lacks an expansion or neck sizing die as well but both pieces that do come with the purchase are made extremely well and were manufactured in the United States. 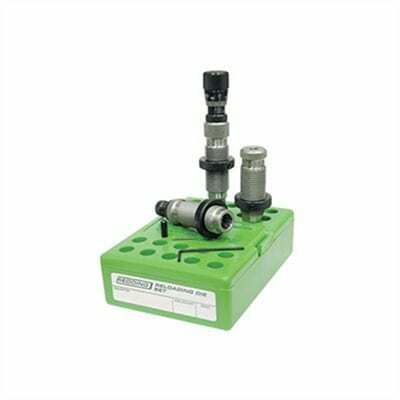 The biggest difference between this set and the RCBS set is that this one comes with a storage case as well for a few more dollars. It’s up to you to decide if spending a few more bucks is worth a convenient way to carry or store them when they’re not in use. Beyond that, the differences are not very drastic. This set is another pair of sizing and seating dies. They’re both very affordable and include a storage case, so they are a few dollars more expensive than the last set. Either this set or the previous one are great budget picks. For our final set, let’s take a look at another two piece collection that has a full-length sizing die and micrometer seating die. The main difference between this pair compared to all the others is the absolute superior quality of their material construction: they're made from some of the finest steel we've seen so far. This is reflected in people who use this product. The U.S. military often uses these sizing and seating dies for their own reloading purposes. This speaks to the versatility and precision offered by this set. Since the U.S. military often is one of the harshest critics when it comes to gun safety and gun hobbyists, you can take their word as a seal of approval and know that you’re getting an excellent pair if you pick this set. The pair are not as affordable as the previous two pairs we looked at, but both are still well within a reasonable price range. The micrometer seating die, in particular, is extremely precise and steady and gives consistent results even after hundreds of uses. This final two-die set has been used by the U.S. military many times due to its extremely durable construction and precision manufacturing. Both are phenomenal in their respective duties and aren’t too expensive for most people to add to their reloading toolsets. Now that you’ve picked out a great set for your 6.5 Creedmoor ammo, let us help explain exactly how to safely set it up. This can be a bit complicated, so don’t worry if you have to read a few times or go slowly at first. The key here is to make sure that your reloading is successful and safe. You’ll increase your speed once you’re used to the whole process. First of all, make sure that the die which you are about to use has been cleaned and lubricated beforehand. You also need to make sure that your press is clean and that no debris is gunking up any of its major areas. For a sizing die, loosen the lock bolt so that the ring can be moved around freely. You'll want to insert the lockable ring into the press so that the hole is facing you. Screw the die upward, then push the press down. Finally, screw it back down until everything is secure. This makes sure the die won't move too much in the process. The goal here is that you don’t want it to be too tight or too loose for the sizing that will come shortly after. Once you have the optimal tightness you can lock the lock ring once again and place it into the press where it will be ready to receive its first case. Check out this video for more information on the details of Creedmoor die setups. Hopefully, this guide has given you all of the critical information necessary to find a great set for your 6.5 Creedmoor. Using dies to reload is becoming more and more popular, particularly as people are discovering that it’s very easy to reload your own ammunition to save money and customize your shooting experience. Happy hunting!